^ An Introduction to the Sunflower Movement. Daybreak Project. 2017年7月22日 [2019年3月1日] （英语）. ^ 2.0 2.1 Austin Ramzy. As Numbers Swell, Students Pledge to Continue Occupying Taiwan’s Legislature. 《紐約時報》. 2014年3月22日 [2019年3月1日] （英语）. ^ 【直擊】警提升府維安　對戰一觸即發. 《蘋果日報》. 2014年3月20日 [2019年3月1日] （繁体中文）. ^ Tseng Ying-yu和Elizabeth Hsu. Protesters break police line, storm Legislature. 中央通訊社. 2014年3月18日 [2019年3月1日] （英语）. ^ 6.0 6.1 6.2 6.3 6.4 6.5 6.6 6.7 這不是太陽花「學運」. 中央研究院. 2015年10月13日 [2019年3月1日] （繁体中文）. ^ Rally backs Taiwan students occupying parliament. 英國廣播公司新聞網. 2014年3月21日 [2019年3月1日] （英语）. ^ Yiyuan Zhou和Renate Lilge-Stodieck. El movimiento girasol de Taiwán (Parte 1). 《大紀元時報》. 2014年4月14日 [2019年3月1日] （西班牙语）. ^ 9.0 9.1 Mark Harrison. The Sunflower Movement in Taiwan. The China Story. 2014年4月18日 [2019年3月1日] （英语）. ^ 黃恐龍 2014年， 第53頁至第55頁; 晏山農等 2015年， 第173頁至第174頁; 港千尋 2015年， 第26頁、第88頁至第89頁、第240頁至第241頁. ^ 黃恐龍 2014年， 第51頁至第53頁; 晏山農等 2015年， 第8頁; 港千尋 2015年， 第124頁至第128頁、第240頁至第241頁. ^ S.Phương. Cách mạng màu sắp diễn ra tại Đài Loan?. petrotimes.vn. 2014年4月1日 [2019年3月1日] （越南语）. ^ 黃恐龍 2014年， 第51頁至第53頁; 港千尋 2015年， 第88頁至第99頁、第124頁至第128頁、第240頁至第241頁. ^ 胡健森. 占領立院 花店老闆送「希望」向日葵給抗議學生、群眾. 雅虎新聞（英语：Yahoo! News）. 2014年3月20日 [2019年3月1日] （繁体中文）. ^ 張卓婷和吳宗哲. 花店老闆捐「太陽花」 盼照亮學運. 新浪. 2014年3月21日 [2019年3月1日] （繁体中文）. ^ 劉定綱 2014年， 第19頁; 公民聲音團隊 2014年， 第6頁; 黃恐龍 2014年， 第15頁; 晏山農等 2015年， 第8頁、第173頁至第174頁; 港千尋 2015年， 第88頁至第89頁、第124頁至第128頁、第240頁至第241頁. ^ Why Sunflowers?. Daybreak Project. 2017年7月20日 [2019年3月1日] （英语）. ^ Relation To History In The Sunflower Movement. Daybreak Project. 2017年7月24日 [2019年3月1日] （英语）. ^ Joe Hhung. Echoes of the Wild Lily Movement. 《英文中國郵報》. 2014年3月24日 [2019年3月1日] （英语）. ^ 黃恐龍 2014年， 第51頁至第53頁; 晏山農等 2015年， 第15頁至第16頁; 港千尋 2015年， 第83頁、第128頁; 吳叡人等 2016年， 第326頁. ^ 公民聲音團隊 2014年， 第6頁; 港千尋 2015年， 第124頁至第128頁. ^ 25.00 25.01 25.02 25.03 25.04 25.05 25.06 25.07 25.08 25.09 25.10 25.11 25.12 25.13 25.14 25.15 25.16 25.17 25.18 25.19 25.20 25.21 25.22 25.23 25.24 25.25 25.26 25.27 25.28 學運大事記. 中央研究院. 2015年10月14日 [2019年3月1日] （繁体中文）. ^ 26.0 26.1 Carlos Moretti. Continúan las protestas en Taiwán. China Files. 2014年3月24日 [2019年3月1日] （西班牙语）. ^ 29.0 29.1 29.2 29.3 Austin Ramzy. Concession Offered, Taiwan Group to End Protest of China Trade Pact. 《紐約時報》. 2014年4月7日 [2019年3月1日] （英语）. ^ 黃恐龍 2014年， 第35頁、第88頁至第89頁、第93頁至第98頁; 港千尋 2015年， 第30頁、第236頁; 吳叡人等 2016年， 第38頁至第39頁、第101頁至第104頁、第133頁、第166頁至第167頁、第179頁. ^ ECFA. Daybreak Project. 2017年7月25日 [2019年3月1日] （英语）. ^ 32.00 32.01 32.02 32.03 32.04 32.05 32.06 32.07 32.08 32.09 32.10 32.11 32.12 32.13 32.14 32.15 32.16 32.17 32.18 32.19 32.20 32.21 32.22 32.23 32.24 32.25 32.26 32.27 32.28 32.29 32.30 32.31 32.32 32.33 32.34 32.35 32.36 32.37 32.38 32.39 32.40 32.41 32.42 32.43 32.44 32.45 32.46 吳介民. 「太陽花運動」への道―台湾市民社会の中国要因に対する抵抗 (PDF). 日本台湾学会. 2015年 [2019年2月14日] （日语）. ^ 劉定綱 2014年， 第16頁; 黃恐龍 2014年， 第35頁; 晏山農等 2015年， 第9頁至第10頁; 港千尋 2015年， 第28頁至第29頁、第236頁至第237頁; 吳叡人等 2016年， 第38頁至第39頁、第101頁至第102頁、第125頁至第126頁、第128頁、第179頁. ^ Mo Yan-chih. Cross-strait service trade pact signed. 《台北時報》. 2014年6月22日 [2019年3月1日] （英语）. ^ 35.0 35.1 35.2 Cindy Sui. Taiwan's services agreement with China triggers concerns. 英國廣播公司新聞網. 2013年10月28日 [2019年3月1日] （英语）. ^ What Was The CSSTA?. Daybreak Project. 2017年7月20日 [2019年3月1日] （英语）. ^ 劉定綱 2014年， 第17頁; 公民聲音團隊 2014年， 第5頁; 黃恐龍 2014年， 第35頁; 晏山農等 2015年， 第9頁至第10頁; 港千尋 2015年， 第27頁至第28頁、第237頁至第238頁; 吳叡人等 2016年， 第125頁至第126頁、第129頁、第179頁至第180頁. 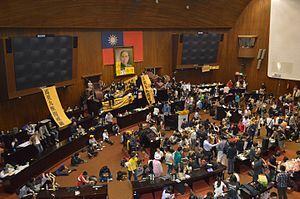 ^ 38.0 38.1 38.2 38.3 Protesters occupy Taiwan parliament over China trade deal. 英國廣播公司新聞網. 2014年3月19日 [2019年3月1日] （英语）. ^ 39.0 39.1 39.2 39.3 比嘉清太. 台湾立法院、学生が占拠…中台貿易協定に反対. 《讀賣新聞》. 2014年3月19日 [2019年2月14日] （日语）. ^ 晏山農等 2015年， 第9頁至第10頁; 吳叡人等 2016年， 第180頁、第212頁至第213頁. ^ 晏山農等 2015年， 第10頁至第15頁; 港千尋 2015年， 第32頁至第33頁; 吳叡人等 2016年， 第118頁至第119頁、第133頁至第135頁、第214頁至第230頁. ^ 42.00 42.01 42.02 42.03 42.04 42.05 42.06 42.07 42.08 42.09 42.10 42.11 42.12 42.13 42.14 42.15 寇謐將. Taiwanese Occupy Legislature Over China Pact. 《外交家雜誌》. 2014年3月20日 [2019年3月1日] （英语）. ^ 劉定綱 2014年， 第17頁; 公民聲音團隊 2014年， 第5頁; 黃恐龍 2014年， 第39頁至第40頁、第59頁; 晏山農等 2015年， 第11頁、第14頁至第15頁、第26頁; 港千尋 2015年， 第238頁至第239頁; 吳叡人等 2016年， 第179頁至第180頁. ^ Was The Sunflower Movement A Sign Of Taiwan’s Incomplete Democratic Transition?. Daybreak Project. 2017年7月25日 [2019年3月1日] （英语）. ^ 黃恐龍 2014年， 第4頁至第5頁、第39頁至第40頁、第47頁至第50頁; 吳叡人等 2016年， 第33頁至第36頁、第123頁至第126頁、第154頁至第155頁. ^ The September Political Struggle. Daybreak Project. 2017年7月24日 [2019年3月1日] （英语）. ^ 黃恐龍 2014年， 第157頁; 港千尋 2015年， 第33頁至第34頁; 吳叡人等 2016年， 第105頁、第133頁. ^ Accusations Of Dictatorship. Daybreak Project. 2017年7月25日 [2019年3月1日] （英语）. ^ 黃恐龍 2014年， 第70頁至第72頁、第78頁至第87頁; 吳叡人等 2016年， 第133頁、第154頁至第155頁. ^ Chris Wang. Ma’s approval rating plunges to 9.2 percent. 《台北時報》. 2013年9月16日 [2019年3月1日] （英语）. ^ 52.0 52.1 Sheryn Lee. Protestors show Taiwanese democracy is alive and kicking. 東亞論壇（英语：East Asia Forum）. 2013年10月8日 [2019年3月1日] （英语）. ^ 53.0 53.1 53.2 53.3 53.4 53.5 Francisco Luis Pérez. Primer aniversario de la protesta que ocupó el Parlamento taiwanés. W Radio（英语：W Radio）. 2015年3月18日 [2019年3月1日] （西班牙语）. ^ 晏山農等 2015年， 第15頁至第17頁、第154頁至第155頁、第319頁至第320頁; 吳叡人等 2016年， 第41頁至第42頁、第103頁至第107頁、第181頁至第182頁. ^ A Reaction Against KMT Crony Capitalism?. Daybreak Project. 2017年7月24日 [2019年3月1日] （英语）. ^ 晏山農等 2015年， 第19頁; 吳叡人等 2016年， 第38頁至第39頁、第43頁至第44頁、第126頁、第154頁至第155頁. ^ Why Do Youth Activists Aim To Preserve Taiwanese History?. Daybreak Project. 2017年7月24日 [2019年3月1日] （英语）. ^ The Wenmeng Pavilion Struggle. Daybreak Project. 2017年7月25日 [2019年3月1日] （英语）. ^ Anti-Eviction Struggles In Military Villages. Daybreak Project. 2017年7月25日 [2019年3月1日] （英语）. ^ 晏山農等 2015年， 第15頁至第17頁; 吳叡人等 2016年， 第330頁至第334頁. ^ 港千尋 2015年， 第236頁; 吳叡人等 2016年， 第104頁至第105頁、第127頁、第181頁至第182頁. ^ 港千尋 2015年， 第236頁; 吳叡人等 2016年， 第127頁. ^ 65.0 65.1 The Wild Strawberry Movement: The Most Direct Predecessor of the Sunflower Movement?. Daybreak Project. 2017年7月25日 [2019年3月1日] （英语）. ^ 68.0 68.1 The Anti-Kuokuang Movement. Daybreak Project. 2017年7月24日 [2019年3月1日] （英语）. ^ 69.0 69.1 The Shilin Wang Family Anti-Eviction Struggle. Daybreak Project. 2017年7月24日 [2019年3月1日] （英语）. ^ 70.0 70.1 黃恐龍 2014年， 第177頁至第179頁; 港千尋 2015年， 第237頁. ^ 72.0 72.1 The Anti-Media Monopoly Movement. Daybreak Project. 2017年7月25日 [2019年3月1日] （英语）. ^ 黃恐龍 2014年， 第177頁至第179頁; 港千尋 2015年， 第237頁; 吳叡人等 2016年， 第128頁至第129頁. ^ 黃恐龍 2014年， 第177頁至第179頁; 吳叡人等 2016年， 第128頁至第129頁. ^ 75.0 75.1 The Miaoli Windmill Struggle. Daybreak Project. 2017年7月25日 [2019年3月1日] （英语）. ^ 76.0 76.1 黃恐龍 2014年， 第61頁至第65頁; 吳叡人等 2016年， 第133頁. ^ 77.0 77.1 黃恐龍 2014年， 第61頁至第65頁. ^ The Hung Chung-Hsiu Incident. Daybreak Project. 2017年7月25日 [2019年3月1日] （英语）. ^ 79.0 79.1 Citizen 1985. Daybreak Project. 2017年11月16日 [2019年3月1日] （英语）. ^ Forced Land Evictions In Dapu, Miaoli. Daybreak Project. 2017年7月25日 [2019年3月1日] （英语）. ^ The Movement To Amend The Birdcage Referendum Law. Daybreak Project. 2017年7月25日 [2019年3月1日] （英语）. ^ 82.0 82.1 Was The Sunflower Movement An Anti-Free Trade Movement?. Daybreak Project. 2017年6月17日 [2019年3月1日] （英语）. ^ 港千尋 2015年， 第27頁、第42頁至第71頁; 吳叡人等 2016年， 第12頁、第18頁至第19頁、第43頁至第44頁. ^ Influence From Occupy Wall Street?. Daybreak Project. 2017年6月9日 [2019年3月1日] （英语）. ^ 晏山農等 2015年， 第17頁至第18頁; 港千尋 2015年， 第27頁、第42頁至第71頁; 吳叡人等 2016年， 第104頁. ^ Structural Economic Causes For The Sunflower Movement?. Daybreak Project. 2017年7月25日 [2019年3月1日] （英语）. ^ 晏山農等 2015年， 第18頁至第19頁; 吳叡人等 2016年， 第106頁、第133頁、第139頁至第140頁. ^ Labor Struggles. Daybreak Project. 2017年7月25日 [2019年3月1日] （英语）. ^ PTT. Daybreak Project. 2017年7月20日 [2019年3月1日] （英语）. ^ 劉定綱 2014年， 第17頁; 公民聲音團隊 2014年， 第5頁; 黃恐龍 2014年， 第39頁至第40頁; 晏山農等 2015年， 第13頁; 港千尋 2015年， 第27頁至第28頁; 吳叡人等 2016年， 第132頁至第133頁、第182頁. ^ 黃恐龍 2014年， 第39頁至第40頁; 晏山農等 2015年， 第13頁、第26頁; 港千尋 2015年， 第30頁、第239頁; 吳叡人等 2016年， 第132頁至第133頁、第182頁. ^ China y Taiwán acuerdan cooperar, en la primera reunión bilateral en 65 años. 英國廣播公司新聞網. 2014年2月11日 [2019年3月1日] （西班牙语）. ^ Taiwán: estudiantes continúan la toma del Parlamento por relaciones comerciales con China. 英國廣播公司新聞網. 2014年4月22日 [2019年3月1日] （西班牙语）. ^ 95.0 95.1 李柏涛. 国台办回应台湾部分团体和学生“反服贸抗争”. 《環球時報》. 2014年3月20日 [2019年3月1日] （英语）. ^ 黃恐龍 2014年， 第42頁; 晏山農等 2015年， 第200頁; 吳叡人等 2016年， 第129頁至第130頁. ^ 97.0 97.1 戴雅真和陳偉婷. 立院審服貿 噪音逼近飛機起飛. 中央通訊社. 2014年3月17日 [2019年3月1日] （繁体中文）. ^ 98.0 98.1 98.2 林思慧和徐子晴. 趁亂宣布完成委員會審查 服貿協議打進院會. 中時電子報. 2014年3月18日 [2019年3月1日] （繁体中文）. ^ 99.00 99.01 99.02 99.03 99.04 99.05 99.06 99.07 99.08 99.09 99.10 工商團體：服貿過搶攻中市場. 《臺灣時報》. 2014年3月20日 [2019年3月1日] （繁体中文）. ^ 100.0 100.1 Sophie Brown. Taiwan's president asks protesters to talk over trade deal. 有線電視新聞網. 2014年3月26日 [2019年3月1日] （英语）. ^ 港千尋 2015年， 第239頁至第240頁; 吳叡人等 2016年， 第186頁. ^ 劉定綱 2014年， 第18頁; 港千尋 2015年， 第30頁; 吳叡人等 2016年， 第182頁至第183頁. ^ 吉村剛史. 「中台協定」反対の学生らが議場占拠　台湾　「産業切り捨てにつながる」. 《產經新聞》. 2014年3月19日 [2019年2月14日] （日语）. ^ 劉定綱 2014年， 第18頁; 公民聲音團隊 2014年， 第5頁; 黃恐龍 2014年， 第14頁、第41頁; 晏山農等 2015年， 第26頁、第336頁; 港千尋 2015年， 第27頁至第28頁、第30頁至第31頁、第240頁; 吳叡人等 2016年， 第129頁至第130頁、第132頁至第133頁、第182頁至第183頁. ^ 劉定綱 2014年， 第18頁; 公民聲音團隊 2014年， 第5頁; 黃恐龍 2014年， 第41頁; 晏山農等 2015年， 第26頁、第336頁; 港千尋 2015年， 第30頁至第31頁、第240頁; 吳叡人等 2016年， 第132頁至第133頁. ^ 劉定綱 2014年， 第18頁; 晏山農等 2015年， 第26頁至第27頁; 港千尋 2015年， 第30頁至第31頁、第240頁; 吳叡人等 2016年， 第106頁至第107頁、第132頁至第133頁、第182頁至第185頁. ^ Declaration Of “120 Hours To Protect Democracy”. Daybreak Project. 2017年7月21日 [2019年3月1日] （英语）. ^ 黃恐龍 2014年， 第42頁; 晏山農等 2015年， 第200頁、第336頁、第340頁至第342頁. ^ 109.0 109.1 109.2 109.3 肖烨. 台两百名学生“攻占立法院”反对服贸协议. 鳳凰衛視. 2014年3月20日 [2019年3月1日] （英语）. ^ 劉定綱 2014年， 第18頁; 公民聲音團隊 2014年， 第5頁; 黃恐龍 2014年， 第15頁、第42頁; 晏山農等 2015年， 第29頁至第31頁、第336頁; 港千尋 2015年， 第28頁、第240頁; 吳叡人等 2016年， 第126頁至第127頁、第166頁、第187頁至第188頁. ^ 111.0 111.1 威克. 台灣反服貿協議團體佔領立法院議事場. 英國廣播公司新聞網. 2014年3月18日 [2019年3月1日] （英语）. ^ 黃恐龍 2014年， 第176頁至第177頁; 晏山農等 2015年， 第31頁、第156頁; 吳叡人等 2016年， 第187頁至第188頁. ^ Adela Lin和Tim Culpan. Taiwan Students Occupy Legislature Over China Pact. 彭博社. 2014年3月19日 [2019年3月1日] （英语）. ^ Maria Kruczkowska. "Rewolucja słoneczników" - Tajwańczycy masowo protestują przeciw układowi handlowemu z Chinami. 《選舉報（英语：Gazeta Wyborcza）》. 2014年3月30日 [2019年3月1日] （波兰语）. ^ 劉定綱 2014年， 第18頁; 公民聲音團隊 2014年， 第5頁; 黃恐龍 2014年， 第42頁; 晏山農等 2015年， 第31頁至第32頁、第156頁至第160頁; 港千尋 2015年， 第91頁至第92頁、第172頁至第177頁、第240頁; 吳叡人等 2016年， 第130頁、第187頁至第188頁. ^ Declaration Of The 318 Occupation of the Legislative Yuan: Oppose The Black Box CSSTA. Daybreak Project. 2017年7月21日 [2019年3月1日] （英语）. ^ 劉定綱 2014年， 第18頁至第19頁; 公民聲音團隊 2014年， 第5頁; 黃恐龍 2014年， 第42頁; 晏山農等 2015年， 第32頁至第37頁、第160頁至第163頁、第336頁、第343頁至第345頁; 港千尋 2015年， 第240頁; 吳叡人等 2016年， 第130頁、第189頁. ^ 吉村剛史. 台湾、行政院占拠の学生ら放水で強制排除　１３０人超負傷　続く議場占拠. 《產經新聞》. 2014年3月24日 [2019年2月14日] （日语）. ^ 温雅琼. 抗议群体占领台湾立法机构 事件中38名警察受伤. 中國新聞社. 2014年3月19日 [2019年3月1日] （简体中文）. ^ Ray Sanchez和Zoe Li. Taiwan Legislature occupiers' ultimatum passes without response from government. 有線電視新聞網. 2014年3月21日 [2019年3月1日] （英语）. ^ 122.0 122.1 Statement By The Second Floor Slave Workers. Daybreak Project. 2017年7月21日 [2019年3月1日] （英语）. ^ 124.0 124.1 124.2 鄒琪. 【攻佔立法院】學生提出四點訴求，要求馬英九王金平明中午前回復. 關鍵評論網. 2014年3月20日 [2019年3月1日] （繁体中文）. ^ 125.0 125.1 125.2 埃菲通訊社. Los estudiantes ocupan el Parlamento de Taiwán. 《先鋒報（英语：La Vanguardia）》. 2014年3月19日 [2019年3月1日] （英语）. ^ Taiwan: des étudiants occupent le parlement. 《費加洛報》. 2014年3月18日 [2019年3月1日] （英语）. ^ 晏山農等 2015年， 第36頁至第37頁; 港千尋 2015年， 第241頁; 吳叡人等 2016年， 第126頁至第127頁、第130頁、第187頁至第189頁. ^ 王家俊. 【直擊】學生三訴求　馬道歉、江下台、警察退出. 《蘋果日報》. 2014年3月19日 [2019年3月1日] （繁体中文）. ^ 劉定綱 2014年， 第18頁至第19頁; 公民聲音團隊 2014年， 第6頁; 晏山農等 2015年， 第36頁至第37頁、第336頁; 港千尋 2015年， 第28頁. ^ 丁文蕾. 台湾有学生暴力反服贸协议 郝龙斌：盼理性沟通. 中國新聞社. 2014年3月20日 [2019年3月1日] （简体中文）. ^ Shih Hsiu-chuan、Su Fang-ho和Jake Chung. Wang promises a solution, response to students’ appeals. 《台北時報》. 2014年3月21日 [2019年3月1日] （英语）. ^ 陈立宇和李志全. 马英九办公室：如有需要会全力配合“立法院”. 中國新聞社. 2014年3月20日 [2019年3月1日] （简体中文）. ^ 陳沂庭. 王金平盼總統傾聽民意 促朝野共識. 雅虎新聞（英语：Yahoo! News）. 2014年3月21日 [2019年3月1日] （繁体中文）. ^ 公民聲音團隊 2014年， 第7頁; 黃恐龍 2014年， 第181頁至第182頁; 晏山農等 2015年， 第45頁至第46頁、第336頁; 港千尋 2015年， 第241頁. ^ 學生聲明：明擴大抗爭 續佔國會. 美麗島電子報. 2014年3月24日 [2019年3月1日] （繁体中文）. ^ 公民聲音團隊 2014年， 第7頁; 黃恐龍 2014年， 第181頁至第182頁; 2015年 吳叡人等， 第45頁至第46頁、第336頁; 2016年， 第191頁. ^ 140.0 140.1 Adam Tyrsett Kuo和Katherine Wei. Activists set conditions to Ma dialogue. 《英文中國郵報》. 2014年3月26日 [2019年3月1日] （英语）. ^ 141.0 141.1 Tim Culpan. Taiwan’s Ma Offers to Meet Student Leaders as Dispute Continues. 彭博社. 2014年3月26日 [2019年3月1日] （英语）. ^ 142.0 142.1 142.2 寇謐將. Occupy the Legislature: Jiang Yi-huah v. Lin Fei-fan. The Far-Eastern Sweet Potato. 2014年3月22日 [2019年3月1日] （英语）. ^ 劉定綱 2014年， 第19頁; 黃恐龍 2014年， 第181頁至第182頁; 吳叡人等 2016年， 第190頁至第192頁. ^ 劉定綱 2014年， 第19頁至第20頁; 公民聲音團隊 2014年， 第7頁; 黃恐龍 2014年， 第181頁至第182頁; 晏山農等 2015年， 第49頁、第336頁; 港千尋 2015年， 第241頁; 吳叡人等 2016年， 第191頁、第336頁至第337頁. ^ 145.0 145.1 Loa Iok-sin和Shih Hsiu-chuan. Jiang-protester talks fail before they start. 《台北時報》. 2014年3月23日 [2019年3月1日] （英语）. ^ 劉定綱 2014年， 第19頁至第20頁; 公民聲音團隊 2014年， 第7頁; 黃恐龍 2014年， 第74頁至第77頁; 晏山農等 2015年， 第49頁、第336頁; 港千尋 2015年， 第241頁; 吳叡人等 2016年， 第130頁. ^ 147.0 147.1 147.2 147.3 李靥. 台舆论谴责"反服贸"暴力行为 吁各界理性寻共识. 中國新聞社. 2014年3月25日 [2019年3月1日] （简体中文）. ^ 148.0 148.1 公民聲音團隊 2014年， 第6頁. ^ 149.0 149.1 太陽花學運陷入持久戰 34人累倒送醫. ETtoday新聞雲. 2014年3月23日 [2019年3月1日] （繁体中文）. ^ 佔領國會》記者會提問機會少 外媒抗議. 《自由時報》. 2014年3月23日 [2019年3月1日] （繁体中文）. ^ 151.0 151.1 Emily Rauhala. The 'Battle of Taipei' Shows Just How Wary of China Young Taiwanese Are. 《時代雜誌》. 2014年3月24日 [2019年3月1日] （英语）. ^ 劉定綱 2014年， 第20頁; 公民聲音團隊 2014年， 第8頁; 黃恐龍 2014年， 第181頁至第182頁; 晏山農等 2015年， 第50頁、第337頁; 港千尋 2015年， 第241頁; 吳叡人等 2016年， 第130頁. ^ Ben Blanchard. Taiwan leader says protest-hit China trade pact vital. 路透社. 2014年3月23日 [2019年3月1日] （英语）. ^ 公民聲音團隊 2014年， 第8頁; 黃恐龍 2014年， 第74頁至第77頁、第181頁至第182頁; 晏山農等 2015年， 第50頁、第337頁; 港千尋 2015年， 第241頁; 吳叡人等 2016年， 第130頁; 吳叡人等 2016年， 第191頁、第336頁至第338頁. ^ 【強勢鎮壓】警抓狂噴水柱　學生肉身擋車. 《蘋果日報》. 2014年3月24日 [2019年3月1日] （繁体中文）. ^ Jason Pan. Sunflower activists demand answers. 《台北時報》. 2015年3月25日 [2019年3月1日] （英语）. ^ 157.0 157.1 157.2 Sophie Brown和Zoe Li. Taiwan police clash with students in protests over trade deal. 有線電視新聞網. 2014年3月25日 [2019年3月1日] （英语）. ^ 劉定綱 2014年， 第20頁; 公民聲音團隊 2014年， 第8頁; 黃恐龍 2014年， 第182頁至第183頁; 晏山農等 2015年， 第53頁至第54頁、第337頁; 港千尋 2015年， 第28頁、第242頁; 吳叡人等 2016年， 第130頁、第192頁. ^ 159.0 159.1 沈茂华. 台民众闯行政院 8人伤送医院. 《聯合早報》. 2014年3月24日 [2019年3月1日] （简体中文）. ^ 黃恐龍 2014年， 第182頁至第183頁; 晏山農等 2015年， 第54頁至第58頁; 港千尋 2015年， 第242頁; 吳叡人等 2016年， 第130頁、第192頁. ^ 公民聲音團隊 2014年， 第8頁; 黃恐龍 2014年， 第182頁至第183頁; 晏山農等 2015年， 第59頁至第61頁、第337頁; 港千尋 2015年， 第242頁、第192頁. ^ “Sunflower Revolution” in Taiwan : STOP Police Brutality, NO to Free Trade Agreements NOW!. Europe Solidaire Sans Frontières. 2014年4月14日 [2019年3月1日] （英语）. ^ Chen Chi-chung、Yuris Ku和James Lee. Executive Yuan protesters dispersed with water cannons. 中央通訊社. 2015年3月24日 [2019年3月1日] （英语）. ^ 黃恐龍 2014年， 第182頁至第183頁; 晏山農等 2015年， 第61頁. ^ 165.0 165.1 Lawrence Chung. More than 150 injured as police evict student protesters from Taiwan parliament. 《南華早報》. 2014年3月24日 [2019年3月1日] （英语）. ^ 劉定綱 2014年， 第20頁; 公民聲音團隊 2014年， 第8頁; 港千尋 2015年， 第28頁、第242頁; 吳叡人等 2016年， 第130頁. ^ 167.0 167.1 中央通訊社. 鎮壓學運調閱小組 學生可列席. 中時電子報. 2014年3月27日 [2019年3月1日] （繁体中文）. ^ 168.0 168.1 劉康彥. 藍委缺席 綠通過成立鎮壓反服貿真相調閱小組. ETtoday新聞雲. 2014年3月27日 [2019年3月1日] （繁体中文）. ^ 学生代表：立法院损失应由立委承担 给他们赎罪的机会. 鳳凰衛視. 2014年3月27日 [2019年3月1日] （简体中文）. ^ 港千尋 2015年， 第242頁; 吳叡人等 2016年， 第130頁至第131頁. ^ 171.0 171.1 台湾の立法院占拠、馬総統と学生代表が会談へ. 路透社. 2014年3月25日 [2019年2月14日] （日语）. ^ Koh Gui Qing. Taiwan's Ma says ready to meet protesters over China trade pact. 路透社. 2014年3月25日 [2019年3月1日] （英语）. ^ 劉定綱 2014年， 第20頁至第21頁; 公民聲音團隊 2014年， 第9頁; 晏山農等 2015年， 第71頁至第72頁、第337頁; 港千尋 2015年， 第243頁; 吳叡人等 2016年， 第194頁. ^ 中央通訊社. 與學生對話 府派代表接觸討論. 中時電子報. 2014年3月25日 [2019年3月1日] （繁体中文）. ^ 公民聲音團隊 2014年， 第9頁; 晏山農等 2015年， 第72頁、第337頁. ^ 吉村剛史. 与野党協議も物別れ　馬総統は学生と対話望む. 《產經新聞》. 2014年3月26日 [2019年2月14日] （日语）. ^ 177.0 177.1 177.2 177.3 民視新聞台. 2014.04.13【台灣演義】太陽花學運. Daybreak Project. 2015年3月24日 [2019年3月1日] （繁体中文）. ^ 公民聲音團隊 2014年， 第9頁; 晏山農等 2015年， 第337頁. ^ Distrust Of ROC Institutions By Activists. Daybreak Project. 2017年8月9日 [2019年3月1日] （英语）. ^ 吉村剛史. 学生側「総統府に誠意なし」と態度硬化　台湾・立法院占拠で. 《產經新聞》. 2014年3月27日 [2019年2月14日] （日语）. ^ 劉定綱 2014年， 第20頁至第21頁; 公民聲音團隊 2014年， 第9頁; 晏山農等 2015年， 第73頁、第78頁至第79頁; 港千尋 2015年， 第243頁. ^ 183.0 183.1 Katherine Wei. DPP lawmakers agree to support cross-strait pact supervisory law. 《英文中國郵報》. 2014年3月27日 [2019年3月1日] （英语）. ^ 公民聲音團隊 2014年， 第9頁; 黃恐龍 2014年， 第56頁至第58頁. ^ 公民聲音團隊 2014年， 第9頁至第10頁; 吳叡人等 2016年， 第195頁. ^ 186.0 186.1 186.2 186.3 李柏涛. 台湾“反服贸”学生向马英九宣战 提4点诉求(图). 《環球時報》. 2014年3月28日 [2019年3月1日] （简体中文）. ^ 187.0 187.1 187.2 李柏涛. 台湾学生宣战 号召330上凯道. 《聯合早報》. 2014年3月28日 [2019年3月1日] （简体中文）. ^ 共同通訊社. 無期限の国会占拠を宣言　台湾の学生ら、総統批判. 《產經新聞》. 2014年3月27日 [2019年2月14日] （日语）. ^ Loa Iok-sin和Shih Hsiu-chuan. Sunday rally planned for Ketagalan Blvd. 《台北時報》. 2015年3月28日 [2019年3月1日] （英语）. ^ Lawrence Chung. Students threaten huge rally to pressure Ma Ying-jeou to drop trade pact with Beijing. 《南華早報》. 2015年3月28日 [2019年3月1日] （英语）. ^ 劉定綱 2014年， 第21頁; 公民聲音團隊 2014年， 第10頁; 黃恐龍 2014年， 第199頁; 晏山農等 2015年， 第81頁、第337頁; 港千尋 2015年， 第243頁. ^ 劉定綱 2014年， 第22頁; 公民聲音團隊 2014年， 第11頁; 晏山農等 2015年， 第86頁至第90頁、第338頁、第361頁至第366頁; 港千尋 2015年， 第244頁; 吳叡人等 2016年， 第131頁、第194頁. ^ Ma Ying-Jeou’s Speech On 329. Daybreak Project. 2017年7月21日 [2019年3月1日] （英语）. ^ 比嘉清太. 台湾総統、立法院占拠の学生らに歩み寄り示す. 《讀賣新聞》. 2014年3月30日 [2019年2月14日] （日语）. ^ 黃恐龍 2014年， 第59頁至第60頁; 晏山農等 2015年， 第87頁至第90頁、第361頁至第366頁; 港千尋 2015年， 第244頁; 吳叡人等 2016年， 第194頁. ^ 197.0 197.1 197.2 宋代倫. 330遊行：主辦單位宣布凱道已滿現場逾35萬人. 《大公報》. 2014年3月30日 [2019年3月1日] （简体中文）. ^ 劉定綱 2014年， 第22頁; 公民聲音團隊 2014年， 第10頁至第11頁; 晏山農等 2015年， 第90頁至第94頁、第338頁; 港千尋 2015年， 第26頁至第27頁. ^ Chris Wang、Lee Hsin-fang和Kan Chih-chi. Protest gathers broad support. 《台北時報》. 2015年3月31日 [2019年3月1日] （英语）. ^ 山本秀也. 野ユリ、野イチゴ…今回は「ヒマワリ」　台湾の学生運動. 《產經新聞》. 2014年3月30日 [2019年2月14日] （日语）. ^ Austin Ramzy. Large Crowds Fill Taipei Streets in Protest Over China Trade Bill. 《紐約時報》. 2014年3月30日 [2019年3月1日] （英语）. ^ 劉定綱 2014年， 第22頁; 公民聲音團隊 2014年， 第11頁; 晏山農等 2015年， 第86頁; 港千尋 2015年， 第244頁. ^ Michael Gold和James Pomfret. Over 100,000 protest in Taiwan over China trade deal. 路透社. 2014年3月30日 [2019年3月1日] （英语）. ^ 公民聲音團隊 2014年， 第11頁; 晏山農等 2015年， 第91頁; 吳叡人等 2016年， 第195頁. ^ Lin Fei-Fan’s Speech On Ketagalan Boulevard On 330. Daybreak Project. 2017年7月21日 [2019年3月1日] （英语）. ^ 公民聲音團隊 2014年， 第11頁; 黃恐龍 2014年， 第199頁至第201頁; 晏山農等 2015年， 第91頁、第367頁至第369頁; 吳叡人等 2016年， 第195頁. ^ 207.0 207.1 207.2 吳叡人等 2016年， 第131頁. ^ Who Was The Organized Opposition To The Sunflower Movement?. Daybreak Project. 2017年7月19日 [2019年3月1日] （英语）. ^ Wu Liang-yi和Stacy Hsu. TRADE PACT SIEGE: White-clad army demand return of Legislative Yuan. 《台北時報》. 2014年3月31日 [2019年3月1日] （英语）. ^ 劉定綱 2014年， 第22頁; 公民聲音團隊 2014年， 第11頁; 晏山農等 2015年， 第93頁至第94頁. ^ 李彥初. 【更新】雞排妹爆乳彈弓嗆白狼　加碼《食神》達叔. 《蘋果日報》. 2014年4月1日 [2019年3月1日] （繁体中文）. ^ Alison Hsiao. ‘White Wolf’ leads pro-pact rally. 《台北時報》. 2014年4月2日 [2019年3月1日] （英语）. ^ 法新社. Taiwan pro-China activists rally against parliament seizure. 《海峽時報》. 2014年4月1日 [2019年3月1日] （英语）. ^ 劉定綱 2014年， 第23頁; 公民聲音團隊 2014年， 第12頁至第13頁; 黃恐龍 2014年， 第202頁至第206頁; 晏山農等 2015年， 第96頁、第98頁至第99頁、第338頁; 港千尋 2015年， 第244頁; 吳叡人等 2016年， 第196頁. ^ Manifesto Of The Untouchables’ Liberation Area. Daybreak Project. 2017年7月21日 [2019年3月1日] （英语）. ^ 公民聲音團隊 2014年， 第12頁; 黃恐龍 2014年， 第233頁至第236頁; 晏山農等 2015年， 第100頁至第101頁、第338頁、第370頁至第372頁; 港千尋 2015年， 第244頁至第245頁. ^ 217.0 217.1 217.2 刘冠廷. “立院”周边反服贸学生零零星星仅百人. 中國評論新聞網. 2014年4月3日 [2019年3月1日] （简体中文）. ^ 劉定綱 2014年， 第24頁; 公民聲音團隊 2014年， 第13頁; 黃恐龍 2014年， 第207頁; 晏山農等 2015年， 第101頁. ^ Le Flanc Radical’s Statement Criticizing The Movement Leadership Following 330. Daybreak Project. 2017年7月21日 [2019年3月1日] （英语）. ^ 公民聲音團隊 2014年， 第13頁; 晏山農等 2015年， 第106頁. ^ 222.0 222.1 鵜飼啓. 台湾、政権も学生も「宣伝戦」　長期化する立法院占拠. 《朝日新聞》. 2014年4月4日 [2019年2月14日] （日语）. ^ 223.0 223.1 223.2 比嘉清太. 中台協定監視案、学生拒否…立法院占拠継続へ. 《讀賣新聞》. 2014年4月4日 [2019年2月14日] （日语）. ^ 劉定綱 2014年， 第24頁; 公民聲音團隊 2014年， 第13頁; 晏山農等 2015年， 第106頁、第338頁、第380頁至第381頁; 港千尋 2015年， 第245頁. ^ 劉定綱 2014年， 第24頁; 公民聲音團隊 2014年， 第13頁; 晏山農等 2015年， 第106頁至第107頁. ^ 227.0 227.1 227.2 周剑. 民调：近5成台湾民众认为反服贸学运应归还议场. 中國台灣網. 2014年4月4日 [2019年3月1日] （简体中文）. ^ 劉定綱 2014年， 第24頁; 吳叡人等 2016年， 第197頁至第198頁. ^ 229.0 229.1 劉定綱 2014年， 第25頁; 公民聲音團隊 2014年， 第14頁至第15頁; 晏山農等 2015年， 第109頁至第111頁、第114頁、第121頁至第122頁、第128頁至第129頁、第133頁至第134頁、第338頁、第410頁至第411頁; 港千尋 2015年， 第248頁; 吳叡人等 2016年， 第196頁至第198頁. ^ 230.0 230.1 Report On The People’s Assembly. Daybreak Project. 2017年7月21日 [2019年3月1日] （英语）. ^ 劉定綱 2014年， 第25頁; 公民聲音團隊 2014年， 第14頁; 黃恐龍 2014年， 第207頁至第208頁; 晏山農等 2015年， 第113頁至第116頁、第338頁; 港千尋 2015年， 第245頁; 吳叡人等 2016年， 第196頁. ^ The Cross Straits Oversight Bill And The Civil Society Version Of The Cross Straits Oversight Bill. Daybreak Project. 2017年11月24日 [2019年3月1日] （英语）. ^ 晏山農等 2015年， 第113頁至第115頁; 港千尋 2015年， 第245頁. ^ 234.0 234.1 佔領國會》王金平保證監督條例未立法 不開服貿協商會議. 《自由時報》. 2014年4月6日 [2019年3月1日] （繁体中文）. ^ 官志雄. 台“立法院长”进议场吁学生退场:先立法再审服贸. 中國新聞社. 2014年4月6日 [2019年3月1日] （简体中文）. ^ 236.0 236.1 鵜飼啓. 占拠学生の要求、応じる姿勢　台湾立法院長が表明. 《朝日新聞》. 2014年4月6日 [2019年2月14日] （日语）. ^ 劉定綱 2014年， 第25頁; 公民聲音團隊 2014年， 第15頁; 晏山農等 2015年， 第118頁至第119頁、第338頁、第396頁至第397頁; 港千尋 2015年， 第26頁至第27頁、第245頁; 吳叡人等 2016年， 第199頁. ^ 劉定綱 2014年， 第25頁; 公民聲音團隊 2014年， 第15頁; 晏山農等 2015年， 第118頁至第119頁、第396頁至第397頁; 港千尋 2015年， 第26頁至第27頁、第245頁; 吳叡人等 2016年， 第131頁; 吳叡人等 2016年， 第199頁. ^ 239.0 239.1 239.2 Maubo Chang. Ruling party lawmaker blames speaker for selling out Kuomintang. 中央通訊社. 2014年4月6日 [2019年3月1日] （英语）. ^ Sunflower sutra. 《經濟學人》. 2014年4月8日 [2019年3月1日] （英语）. ^ 黃恐龍 2014年， 第59頁至第60頁; 吳叡人等 2016年， 第166頁; 吳叡人等 2016年， 第199頁. ^ 242.0 242.1 Maubo Chang. Ma calls for early passage of services pact despite Wang's pledge. 中央通訊社. 2014年4月6日 [2019年3月1日] （英语）. ^ 劉定綱 2014年， 第25頁; 晏山農等 2015年， 第120頁至第121頁. ^ 244.0 244.1 左秋子. “太阳花学运”即将落幕. 华夏经纬网. 2014年4月8日 [2019年3月1日] （简体中文）. ^ 245.0 245.1 晏山農等 2015年， 第125頁至第126頁. ^ 晏山農等 2015年， 第125頁至第126頁; 吳叡人等 2016年， 第200頁. ^ 劉定綱 2014年， 第25頁; 晏山農等 2015年， 第120頁; 港千尋 2015年， 第245頁; 吳叡人等 2016年， 第200頁. ^ Statement On Withdrawing From The Legislative Yuan. Daybreak Project. 2017年7月21日 [2019年3月1日] （英语）. ^ 吉村剛史. 学生側「１０日に退去」と発表　台湾の議場占拠、収束の見通し. 《產經新聞》. 2014年4月7日 [2019年2月14日] （日语）. ^ Taipei, los estudiantes anuncian la finalización del asedio al parlamento. 亞洲新聞網（英语：AsiaNews）. 2014年4月8日 [2019年3月1日] （西班牙语）. ^ 251.0 251.1 Michael Gold. Taiwan protesters to end sit-in over China trade pact. 路透社. 2014年4月7日 [2019年3月1日] （英语）. ^ Lu Chen. Los manifestantes de Taiwán dan fin a la ocupación del parlamento. 《大紀元時報》. 2014年4月9日 [2019年3月1日] （西班牙语）. ^ 劉定綱 2014年， 第25頁; 公民聲音團隊 2014年， 第15頁; 黃恐龍 2014年， 第211頁; 晏山農等 2015年， 第123頁至第127頁、第339頁、第398頁至第400頁; 港千尋 2015年， 第26頁至第27頁、第245頁; 吳叡人等 2016年， 第131頁至第132頁、第166頁、第199頁至第200頁. ^ 公民聲音團隊 2014年， 第15頁; 黃恐龍 2014年， 第210頁; 晏山農等 2015年， 第121頁; 港千尋 2015年， 第245頁至第246頁. ^ 兰文. 反服贸学生退场 王金平8日上午召开朝野协商. 台海网. 2014年4月8日 [2019年3月1日] （简体中文）. ^ Brice Pedroletti. A Taïwan, les étudiants lèvent le camp et crient victoire. 《世界報》. 2014年4月11日 [2019年3月1日] （法语）. ^ 公民聲音團隊 2014年， 第15頁至第16頁; 黃恐龍 2014年， 第112頁至第113頁、第290頁至第295頁; 晏山農等 2015年， 第128頁、第129頁至第131頁、第134頁至第137頁、第290頁至第300頁; 港千尋 2015年， 第245頁; 吳叡人等 2016年， 第200頁. ^ 公民聲音團隊 2014年， 第17頁; 黃恐龍 2014年， 第211頁至第213頁; 晏山農等 2015年， 第137頁至第139頁、第171頁至第172頁、第339頁、第401頁至第403頁; 港千尋 2015年， 第246頁. ^ 259.0 259.1 259.2 赵雪晨. 台湾反服贸学生活动落幕 已退出“立法院”(图). 海外網. 2014年4月10日 [2019年3月1日] （简体中文）. ^ 260.0 260.1 鈴木玲子. 台湾:議場占拠から２４日目　学生らが退去. 《每日新聞》. 2014年4月10日 [2019年2月14日] （日语）. ^ ai Ya-chen和Elaine Hou. Student-led protesters end occupation of Legislature. 中央通訊社. 2014年4月10日 [2019年3月1日] （英语）. ^ 比嘉清太. 中台協定、審議先送りへ…占拠学生ら議場退去. 《讀賣新聞》. 2014年4月10日 [2019年2月14日] （日语）. ^ 公民聲音團隊 2014年， 第17頁; 晏山農等 2015年， 第140頁至第141頁、第339頁、第404頁至第409頁; 港千尋 2015年， 第246頁; 吳叡人等 2016年， 第131頁至第132頁、第166頁. ^ 公民聲音團隊 2014年， 第17頁; 晏山農等 2015年， 第141頁至第142頁、第33頁. ^ 公民聲音團隊 2014年， 第16頁; 晏山農等 2015年， 第128頁、第142頁至第144頁、第190頁至第191頁、第339頁; 港千尋 2015年， 第246頁. ^ 公民聲音團隊 2014年， 第16頁; 黃恐龍 2014年， 第211頁至第213頁、第296頁至第300頁; 晏山農等 2015年， 第144頁至第146頁、第191頁至第193頁、第339頁; 港千尋 2015年， 第246頁. ^ 公民聲音團隊 2014年， 第6頁; 黃恐龍 2014年， 第59頁至第60頁; 吳叡人等 2016年， 第130頁. ^ 268.0 268.1 Tseng Ying-yu、Ku Chuan和Elaine Hou. Protesters lay out demands, vow to continue occupation of Legislature. 中央通訊社. 2014年3月23日 [2019年3月1日] （英语）. ^ 公民聲音團隊 2014年， 第8頁; 晏山農等 2015年， 第86頁; 港千尋 2015年， 第26頁至第27頁; 港千尋 2015年， 第242頁; 吳叡人等 2016年， 第131頁、第166頁. ^ Did Everyone Understand What The Demands Of The Movement Were?. Daybreak Project. 2017年6月17日 [2019年3月1日] （英语）. ^ How Did The Occupiers Understand What They Were Doing?. Daybreak Project. 2017年6月17日 [2019年3月1日] （英语）. ^ 272.0 272.1 晏山農等 2015年， 第320頁至第322頁. ^ Was The Sunflower Movement An Anti-China Movement?. Daybreak Project. 2017年6月17日 [2019年3月1日] （英语）. ^ What Was The Movement Attempting To Address?. Daybreak Project. 2017年7月22日 [2019年3月1日] （英语）. ^ Was The Sunflower Movement A Taiwanese Independence Movement?. Daybreak Project. 2017年11月13日 [2019年3月1日] （英语）. ^ 黃恐龍 2014年， 第17頁; 晏山農等 2015年， 第328頁; 港千尋 2015年， 第29頁; 吳叡人等 2016年， 第135頁. ^ 晏山農等 2015年， 第179頁; 港千尋 2015年， 第32頁至第33頁; 吳叡人等 2016年， 第54頁至第55頁、第134頁. ^ Cindy Chang. Taiwanese students protest trade pact with mainland China. 《洛杉磯時報》. 2014年3月23日 [2019年3月1日] （英语）. ^ Marie-Alice McLean-Dreyfus. Protest Songs and Taiwanese Identity in the Sunflower Movement. Asia Dialogue. 2014年4月9日 [2019年3月1日] （英语）. ^ The Sunflower Movement and Shifting Taiwanese Identity. Daybreak Project. 2017年6月17日 [2019年3月1日] （英语）. ^ 黃恐龍 2014年， 第100頁至第113頁; 吳叡人等 2016年， 第26頁至第27頁. ^ What Was New About The Sunflower Movement In Terms Of Taiwanese Identity?. Daybreak Project. 2017年7月19日 [2019年3月1日] （英语）. ^ Klaus Bardenhagen. Studenten besetzen Taiwans Parlament. 《法蘭克福匯報》. 2014年3月19日 [2019年3月1日] （德语）. ^ 黃恐龍 2014年， 第34頁至第41頁、第47頁至第50頁; 晏山農等 2015年， 第17頁; 港千尋 2015年， 第30頁至第32頁、第89頁; 吳叡人等 2016年， 第134頁. ^ Pierre Rousset. El movimiento girasol en Taiwán. 《彩風（西班牙语：Viento Sur）》. 2014年12月8日 [2019年3月1日] （西班牙语）. ^ 黃恐龍 2014年， 第59頁至第60頁; 港千尋 2015年， 第29頁至第30頁. ^ 鈴木玲子. 台湾:「民主主義救う行動だ」立法院占拠の学生指導者. 《每日新聞》. 2014年3月29日 [2019年2月14日] （日语）. ^ Was The Sunflower Movement A Radical Democracy?. Daybreak Project. 2017年7月20日 [2019年3月1日] （英语）. ^ 晏山農等 2015年， 第179頁至第180頁; 吳叡人等 2016年， 第26頁至第27頁、第135頁. ^ Why Was The Sunflower Movement Thought Of As A Student Movement?. Daybreak Project. 2017年7月20日 [2019年3月1日] （英语）. ^ 黃恐龍 2014年， 第216頁至第219頁; 晏山農等 2015年， 第8頁至第9頁、第15頁至第17頁; 吳叡人等 2016年， 第136頁至第138頁. ^ 晏山農等 2015年， 第10頁至第12頁; 吳叡人等 2016年， 第106頁至第107頁、第129頁、第132頁、第180頁至第181頁. ^ 晏山農等 2015年， 第12頁、第27頁、第410頁; 吳叡人等 2016年， 第129頁、第132頁、第180頁至第183頁. ^ 晏山農等 2015年， 第12頁至第13頁、第27頁至第28頁、第410頁; 港千尋 2015年， 第239頁; 吳叡人等 2016年， 第129頁、第181頁至第183頁、第188頁至第189頁. ^ Student Groups And The Sunflower Movement. Daybreak Project. 2017年11月19日 [2019年3月1日] （英语）. ^ 晏山農等 2015年， 第72頁至第73頁、第346頁至第359頁; 吳叡人等 2016年， 第130頁. ^ The Taiwan Rural Front. Daybreak Project. 2017年7月25日 [2019年3月1日] （英语）. ^ Le Flanc Radical. Daybreak Project. 2017年7月25日 [2019年3月1日] （英语）. ^ The Alliance Of Referendum For Taiwan. Daybreak Project. 2017年7月25日 [2019年3月1日] （英语）. ^ 黃恐龍 2014年， 第290頁至第291頁; 晏山農等 2015年， 第28頁、第189頁至第193頁. ^ Indigenous Participation In The Sunflower Movement. Daybreak Project. 2017年7月24日 [2019年3月1日] （英语）. ^ LGBTQ Participation In The Sunflower Movement. Daybreak Project. 2017年7月25日 [2019年3月1日] （英语）. ^ 公民聲音團隊 2014年， 第6頁; 晏山農等 2015年， 第37頁至第38頁、第73頁至第78頁; 吳叡人等 2016年， 第136頁至第139頁、第187頁至第188頁、第192頁至第193頁. ^ Conditions Within The Legislature. Daybreak Project. 2017年7月25日 [2019年3月1日] （英语）. ^ 晏山農等 2015年， 第32頁至第34頁、第163頁至第174頁; 港千尋 2015年， 第138頁至第141頁. ^ 鵜飼啓. 台湾学生ら、立法院占拠　中国との協定めぐり与党に抗議. 《朝日新聞》. 2014年3月19日 [2019年2月14日] （日语）. ^ 鵜飼啓. 台湾の学生側集会に首相、対話は決裂　立法院占拠. 《朝日新聞》. 2014年3月23日 [2019年2月14日] （日语）. ^ 公民聲音團隊 2014年， 第7頁; 晏山農等 2015年， 第175頁至第176頁; 港千尋 2015年， 第119頁; 吳叡人等 2016年， 第136頁至第137頁. ^ 晏山農等 2015年， 第39頁至第40頁; 吳叡人等 2016年， 第130頁、第137頁至第138頁. ^ Traffic Direction In The Occupation Encampment. Daybreak Project. 2017年7月24日 [2019年3月1日] （英语）. ^ 黃恐龍 2014年， 第262頁; 晏山農等 2015年， 第44頁、第46頁、第176頁. ^ 黃恐龍 2014年， 第247頁至第253頁; 港千尋 2015年， 第162頁至第167頁、第182頁至第189頁. ^ 黃恐龍 2014年， 第260頁至第261頁、第268頁至第275頁、第284頁至第287頁; 吳叡人等 2016年， 第138頁至第139頁. ^ Free Supplies And Services. Daybreak Project. 2017年7月24日 [2019年3月1日] （英语）. ^ 劉定綱 2014年， 第19頁; 黃恐龍 2014年， 第224頁至第227頁、第263頁至第267頁; 港千尋 2015年， 第130頁至第136頁、第178頁至第181頁; 吳叡人等 2016年， 第138頁至第139頁. ^ Medical Aid In The Occupation. Daybreak Project. 2017年7月24日 [2019年3月1日] （英语）. ^ 公民聲音團隊 2014年， 第6頁; 黃恐龍 2014年， 第254頁至第259頁; 晏山農等 2015年， 第176頁至第178頁; 港千尋 2015年， 第18頁至第19頁、第80頁、第89頁、第139頁、第142頁至第145頁、第152頁至第153頁; 吳叡人等 2016年， 第138頁至第139頁. ^ Lawyers Participating In The Sunflower Movement. Daybreak Project. 2017年7月24日 [2019年3月1日] （英语）. ^ Food Vendors And Booksellers. Daybreak Project. 2017年7月24日 [2019年3月1日] （英语）. ^ Soapbox Discussions In The Occupation. Daybreak Project. 2017年7月24日 [2019年3月1日] （英语）. ^ Speakers At The Legislative Yuan. Daybreak Project. 2017年7月24日 [2019年3月1日] （英语）. ^ 港千尋 2015年， 第130頁至第136頁、第202頁至第207頁; 吳叡人等 2016年， 第137頁至第138頁. ^ People’s Assemblies. Daybreak Project. 2017年11月25日 [2019年3月1日] （英语）. ^ 晏山農等 2015年， 第113頁至第116頁; 吳叡人等 2016年， 第137頁至第138頁. ^ Splinter Tendencies Within The Sunflower Movement. Daybreak Project. 2017年11月18日 [2019年3月1日] （英语）. ^ The Untouchables’ Liberation Area. Daybreak Project. 2017年11月18日 [2019年3月1日] （英语）. ^ 黃恐龍 2014年， 第233頁至第236頁; 晏山農等 2015年， 第100頁至第101頁、第103頁至第104頁、第180頁至第182頁、第411頁; 港千尋 2015年， 第244頁至第245頁; 吳叡人等 2016年， 第137頁至第138頁. ^ The Independent Company Of Lane Eight. Daybreak Project. 2017年11月13日 [2019年3月1日] （英语）. ^ The Second Floor Slave Workers. Daybreak Project. 2017年7月24日 [2019年3月1日] （英语）. ^ 公民聲音團隊 2014年， 第17頁; 黃恐龍 2014年， 第22頁至第23頁; 晏山農等 2015年， 第38頁、第131頁至第132頁、第171頁至第172頁、第182頁至第183頁、第273頁至第279頁; 吳叡人等 2016年， 第136頁至第137頁. ^ The NTU Department Of Social Sciences. Daybreak Project. 2017年7月24日 [2019年3月1日] （英语）. ^ Attempts To Sabotage The Movement?. Daybreak Project. 2017年7月19日 [2019年3月1日] （英语）. ^ 黃恐龍 2014年， 第176頁至第180頁; 晏山農等 2015年， 第217頁至第230頁. ^ Sexualization Of Students By Media Commentators And Others. Daybreak Project. 2017年7月25日 [2019年3月1日] （英语）. ^ 黃恐龍 2014年， 第176頁至第177頁; 晏山農等 2015年， 第127頁、第169頁至第170頁、第214頁至第217頁. ^ The Need To Overcome Traditional Media In The Movement. Daybreak Project. 2017年7月24日 [2019年3月1日] （英语）. ^ New Media And The Sunflower Movement. Daybreak Project. 2017年6月17日 [2019年3月1日] （英语）. ^ Social Media And The Sunflower Movement. Daybreak Project. 2017年6月17日 [2019年3月1日] （英语）. ^ 公民聲音團隊 2014年， 第5頁; 黃恐龍 2014年， 第42頁至第43頁; 晏山農等 2015年， 第204頁至第205頁; 吳叡人等 2016年， 第383頁至第385頁. ^ Livestreaming During The Movement. Daybreak Project. 2017年7月16日 [2019年3月1日] （英语）. ^ 公民聲音團隊 2014年， 第5頁; 黃恐龍 2014年， 第42頁至第46頁; 晏山農等 2015年， 第34頁、第200頁至第201頁、第212頁至第213頁; 港千尋 2015年， 第198頁至第201頁. ^ 公民聲音團隊 2014年， 第8頁; 港千尋 2015年， 第83頁至第85頁; 吳叡人等 2016年， 第130頁、第192頁、第326頁至第327頁. ^ Internet Culture And The Sunflower Movement. Daybreak Project. 2017年6月27日 [2019年3月1日] （英语）. ^ 黃恐龍 2014年， 第123頁至第128頁; 晏山農等 2015年， 第202頁至第203頁. ^ Attempts At International Outreach During The Movement. Daybreak Project. 2017年7月20日 [2019年3月1日] （英语）. ^ 公民聲音團隊 2014年， 第6頁; 晏山農等 2015年， 第203頁至第204頁; 港千尋 2015年， 第146頁至第151頁. ^ 公民聲音團隊 2014年， 第8頁、第11頁; 黃恐龍 2014年， 第280頁至第283頁; 晏山農等 2015年， 第67頁至第68頁、第70頁、第84頁、第243頁至第245頁、第338頁; 港千尋 2015年， 第208頁至第209頁. ^ g0v. Daybreak Project. 2017年6月14日 [2019年3月1日] （英语）. ^ Watchout. Daybreak Project. 2017年7月25日 [2019年3月1日] （英语）. ^ 公民聲音團隊 2014年， 第5頁; 黃恐龍 2014年， 第280頁至第281頁; 晏山農等 2015年， 第208頁至第211頁. ^ NewseForum. Daybreak Project. 2017年7月22日 [2019年3月1日] （英语）. ^ 黃恐龍 2014年， 第280頁至第281頁; 晏山農等 2015年， 第206頁至第208頁; 港千尋 2015年， 第94頁至第95頁、第224頁至第233頁. ^ Economic Justifications For The CSSTA. Daybreak Project. 2017年7月25日 [2019年3月1日] （英语）. ^ 公民聲音團隊 2014年， 第11頁、第13頁; 黃恐龍 2014年， 第74頁至第77頁; 晏山農等 2015年， 第87頁至第90頁; 吳叡人等 2016年， 第130頁. ^ 公民聲音團隊 2014年， 第11頁; 公民聲音團隊 2014年， 第12頁; 晏山農等 2015年， 第87頁至第90頁; 吳叡人等 2016年， 第130頁、第166頁. ^ 晏山農等 2015年， 第86頁至第90頁; 吳叡人等 2016年， 第130頁. ^ 江揆：先立法再審查　不符實際狀況. 《蘋果日報》. 2014年4月7日 [2019年3月1日] （繁体中文）. ^ 劉定綱 2014年， 第21頁至第22頁; 公民聲音團隊 2014年， 第10頁. ^ Shih Hsiu-chuan、Wang Wen-hsuan和Sean Lin. Premier disparages students who ‘complain all day’. 《台北時報》. 2014年6月11日 [2019年3月1日] （英语）. ^ 黃麗芸、王鴻國和李先鳳. 雙北市長：台民主不容暴力破壞. 《英文台灣日報》. 2014年3月24日 [2019年3月1日] （繁体中文）. ^ Tang Pei-chun和Lilian Wu. KMT aiming for item-by-item review of pact at floor session. 《台北時報》. 2014年3月24日 [2019年3月1日] （英语）. ^ Shih Hsiu-chuan. LEGISLATIVE SIEGE: KMT open to line-by-line review of pact. 《台北時報》. 2014年3月22日 [2019年3月1日] （英语）. ^ 377.0 377.1 Chris Wang. TRADE PACT SIEGE: KMT says open to making concessions. 《台北時報》. 2014年3月28日 [2019年3月1日] （英语）. ^ Loa Iok-sin. Jiang defends eviction, rejects demands. 《台北時報》. 2014年3月29日 [2019年3月1日] （英语）. ^ Chris Wang. DPP says no more interparty talks. 《台北時報》. 2014年3月29日 [2019年3月1日] （英语）. ^ Accusations Of Populism, That The Movement Was Engineered By The DPP. Daybreak Project. 2017年7月20日 [2019年3月1日] （英语）. ^ 382.0 382.1 382.2 孙伟伦. 服贸冲突 台股4天蒸发5337亿. 《聯合早報》. 2014年3月24日 [2019年3月1日] （简体中文）. ^ 中央通訊社. TRADE PACT SIEGE: Economic minister to tour universities, promote pact. 《台北時報》. 2014年4月7日 [2019年3月1日] （英语）. ^ 吉村剛史. 台湾議会占拠、長期化も　馬総統と議長　足並みに乱れ. 《產經新聞》. 2014年3月21日 [2019年2月14日] （日语）. ^ Brice Pedroletti. A Taipei, l'accord de libre-échange sino-taïwanais provoque la colère des étudiants. 《世界報》. 2014年3月20日 [2019年3月1日] （英语）. ^ 晏山農等 2015年， 第44頁至第45頁; 港千尋 2015年， 第88頁; 吳叡人等 2016年， 第186頁. ^ 劉定綱 2014年， 第19頁; 公民聲音團隊 2014年， 第6頁; 黃恐龍 2014年， 第220頁、第278頁至第279頁; 晏山農等 2015年， 第40頁至第41頁、第43頁至第44頁; 港千尋 2015年， 第158頁至第161頁、第241頁. ^ 晏山農等 2015年， 第41頁至第42頁、第304頁至第315頁; 吳叡人等 2016年， 第190頁. ^ 390.0 390.1 390.2 Chen Yi-ching和Rachel Lin. University heads call on Ma to respond to occupiers. 《台北時報》. 2014年3月23日 [2019年3月1日] （英语）. ^ Lee I-chia和Shih Hsiu-chuan. NTU alumni urge Jiang to resign. 《台北時報》. 2014年3月28日 [2019年3月1日] （英语）. ^ Chen Chi-chung和James Lee. Students' association calls for 'strike' to support protests. 中央通訊社. 2014年3月24日 [2019年3月1日] （英语）. ^ Weng Yu-huang、Huang Pang-ping和Stacy Hsu. LEGISLATIVE SIEGE: Some departments back protesters by canceling classes. 《台北時報》. 2014年3月24日 [2019年3月1日] （英语）. ^ Chen Yi-ching、Tan Chia-ling和Jake Chung. TRADE PACT SIEGE: University groups call for strike. 《台北時報》. 2014年3月25日 [2019年3月1日] （英语）. ^ 395.0 395.1 台28學生團體發起罷課. 《頭條日報》. 2014年3月24日 [2019年3月1日] （繁体中文）. ^ 396.0 396.1 賴映秀. 1400人連署罷課 聲援反服貿佔領運動. ETtoday新聞雲. 2014年3月20日 [2019年3月1日] （繁体中文）. ^ 晏山農等 2015年， 第67頁、第337頁; 港千尋 2015年， 第242頁. ^ 398.0 398.1 杜静. 化解反服贸僵局 台11所大学校长向马英九建言. 中國新聞社. 2014年3月28日 [2019年3月1日] （简体中文）. ^ 劉定綱 2014年， 第22頁; 公民聲音團隊 2014年， 第10頁; 晏山農等 2015年， 第83頁. ^ 400.0 400.1 吳叡人等 2016年， 第168頁. ^ 401.0 401.1 401.2 401.3 401.4 黃巧雯. 工商團體：服貿過可全力拼經濟. 中央通訊社. 2014年3月19日 [2019年3月1日] （简体中文）. ^ 402.0 402.1 402.2 John Liu. ROCCOC expresses support for trade pact. 《英文中國郵報》. 2014年3月27日 [2019年3月1日] （英语）. ^ Ted Chen. Business, industry associations call for an end to protests. 《英文中國郵報》. 2014年3月26日 [2019年3月1日] （英语）. ^ 孫彬訓. 銀行公會挺服貿 理事長發3聲明. 中時電子報. 2014年3月27日 [2019年3月1日] （繁体中文）. ^ Joint Statement By Labor Unions In Support Of The Sunflower Movement. Daybreak Project. 2017年7月21日 [2019年3月1日] （英语）. ^ 劉定綱 2014年， 第25頁; 公民聲音團隊 2014年， 第14頁; 晏山農等 2015年， 第112頁至第113頁、第382頁至第385頁. ^ 近3百位電機資訊教授連署反對服貿開放資通訊產業. iThome. 2014年4月10日 [2019年3月1日] （繁体中文）. ^ Shelley Shan. TRADE PACT SIEGE: Experts decry NCC telecom plans. 《台北時報》. 2014年4月10日 [2019年3月1日] （英语）. ^ Social Attitudes Towards Young People And The Sunflower Movement. Daybreak Project. 2017年7月25日 [2019年3月1日] （英语）. ^ 聲援反服貿！九把刀：立法院現在是真正的民主殿堂了. ETtoday新聞雲. 2014年3月19日 [2019年3月1日] （繁体中文）. ^ 张琳. 台湾学生反服贸占领立法院 五月天张悬集体声援. 鳳凰衛視. 2014年3月20日 [2019年3月1日] （简体中文）. ^ 台灣學生佔領立院　萬人聲援. 《蘋果日報》. 2014年3月20日 [2019年3月1日] （繁体中文）. ^ 台灣藝人作家 聲援佔領立法院. 主場新聞. 2014年3月19日 [2019年3月1日] （繁体中文）. ^ 雞排妹接禁口令. 《太陽報》. 2014年3月23日 [2019年3月1日] （繁体中文）. ^ 【佔領立院】強國網民不屑五月天：你敢在微博說反台獨我就信你!. 《蘋果日報》. 2014年3月21日 [2019年3月1日] （繁体中文）. ^ 【短片】【阿信哭了!】強國網民圍插 阿信1.4萬人面前哭了：經歷對自己最嚴重的懷疑. 《蘋果日報》. 2014年3月23日 [2019年3月1日] （繁体中文）. ^ 【安撫強國？】係咪「反服貿」？ 林宥嘉學阿信解釋：轉貼未看清標題. 《蘋果日報》. 2014年3月23日 [2019年3月1日] （繁体中文）. ^ 420.0 420.1 Outrage Over The Storming Of The Executive Yuan, But Not The Storming Of The Legislative Yuan?. Daybreak Project. 2017年7月25日 [2019年3月1日] （英语）. ^ 公民聲音團隊 2014年， 第8頁; 港千尋 2015年， 第83頁至第85頁; 吳叡人等 2016年， 第106頁至第107頁、第192頁、第326頁至第327頁. ^ Feng Yi-en和Stacy Hsu. TRADE PACT SIEGE: Celebrities label president, premier ‘dictators’. 《台北時報》. 2014年3月25日 [2019年3月1日] （英语）. ^ Was All Of Taiwanese Society Supportive Of The Movement?. Daybreak Project. 2017年7月25日 [2019年3月1日] （英语）. ^ Did The Public See The Sunflower Movement As Justified?. Daybreak Project. 2017年7月25日 [2019年3月1日] （英语）. ^ 林连金. 反服贸抗争惊传溅血　警车被砸志工遭砍伤. 台海網. 2014年3月22日 [2019年3月1日] （简体中文）. ^ 共同通訊社. 台湾総統府で対話を　馬氏、学生に呼び掛け　占拠支持は５１％に. 47NEWS（日语：47NEWS）. 2014年3月26日 [2019年2月14日] （日语）. ^ 428.0 428.1 比嘉清太. 台湾学生代表「成果あった」…立法院から退去へ. 《讀賣新聞》. 2014年4月7日 [2019年2月14日] （日语）. ^ 吉村剛史. 民進党主席に蔡氏有力　台湾　現職不出馬で一本化. 《產經新聞》. 2014年4月15日 [2019年2月14日] （日语）. ^ 社评：台“立法院”被攻占，大陆不妨围观. 《環球時報》. 2014年3月21日 [2019年3月1日] （英语）. ^ 李欣. 台湾学生暴力占领立法机构为哪般. 华夏经纬网. 2014年3月24日 [2019年3月1日] （简体中文）. ^ 共同通訊社. 中国、台湾の抗議行動に不快感　学生への支援表明の野党をけん制. 《產經新聞》. 2014年3月27日 [2019年2月14日] （日语）. ^ 鄢烈山. 我为何不能认同学生的“占领”行动. 新浪. 2014年3月25日 [2019年3月1日] （简体中文）. ^ 蕭瀚. 台湾"服贸风波"与政治自由的边界. 《華爾街日報》. 2014年3月26日 [2019年3月1日] （简体中文）. ^ 436.0 436.1 游琁如. 香港遊客聲援：愛台灣，堅持守護 現場靜坐學生含淚. ETtoday新聞雲. 2014年3月20日 [2019年3月1日] （繁体中文）. ^ 葉政淳. 佔台生夜佔立法院，摑了佔中一巴掌. 熱血時報. 2014年3月19日 [2019年3月1日] （繁体中文）. ^ 黃世澤. 佔立法院與佔中（時事評論員　黃世澤）. 《蘋果日報》. 2014年3月20日 [2019年3月1日] （繁体中文）. ^ 黃恐龍 2014年， 第89頁至第91頁; 吳叡人等 2016年， 第156頁. ^ 港人網上聯署撐台學生 「不要成為第二個香港」. 主場新聞. 2014年3月21日 [2019年3月1日] （繁体中文）. ^ 441.0 441.1 林樂天. 台灣「太陽花學運」港星也「參一腳」！何韻詩、杜汶澤PO文力挺. 《臺灣時報》. 2014年3月24日 [2019年3月1日] （简体中文）. ^ 共同通訊社. 台湾の学生支持…香港で８００人デモ. 《產經新聞》. 2014年3月30日 [2019年2月14日] （日语）. ^ Did The Sunflower Movement Disprove “Say Goodbye To Taiwan”?. Daybreak Project. 2017年7月24日 [2019年3月1日] （英语）. ^ 晏山農等 2015年， 第326頁; 吳叡人等 2016年， 第119頁至第122頁. 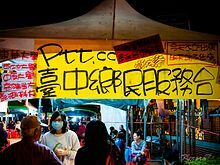 ^ Taiwan: Restraint urged in protests over China trade deal. 國際特赦組織. 2014年3月19日 [2019年3月1日] （英语）. ^ 明永昌. 白宫网站反服贸联署 已达回覆门槛. 《聯合早報》. 2014年3月23日 [2019年3月1日] （简体中文）. ^ Tim Culpan. Taiwan’s President to Meet Protesters Who Seized Legislature. 彭博社. 2014年3月25日 [2019年3月1日] （英语）. ^ Chris Wang. TRADE PACT SIEGE: Politicians, civic groups lash out over crackdown. 《台北時報》. 2014年3月25日 [2019年3月1日] （英语）. ^ Taiwan-Japan Ties In The Sunflower Movement. Daybreak Project. 2017年7月20日 [2019年3月1日] （英语）. ^ Tony Phillips. Taiwanese abroad show support. 《台北時報》. 2014年3月25日 [2019年3月1日] （英语）. ^ 公民聲音團隊 2014年， 第8頁; 港千尋 2015年， 第88頁. ^ Jason Pan. TRADE PACT SIEGE: Rallies held across globe for Sunflower movement. 《台北時報》. 2014年4月1日 [2019年3月1日] （英语）. ^ The Overseas Solidarity Movement. Daybreak Project. 2017年7月20日 [2019年3月1日] （英语）. ^ 公民聲音團隊 2014年， 第8頁; 港千尋 2015年， 第244頁. ^ Loa Iok-sin. Polish media asked to retract siege reporting. 《台北時報》. 2014年4月6日 [2019年3月1日] （英语）. ^ 458.0 458.1 商周訪希拉蕊 美置台優先順位. 中央通訊社. 2014年6月24日 [2019年3月1日] （繁体中文）. ^ Hillary Clinton warns against over-dependence on China. 《英文台灣日報》. 2014年6月25日 [2019年3月1日] （英语）. ^ 翁嫆琄. 希拉蕊：依賴中國太深 會讓台灣變脆弱. 新頭殼. 2014年6月24日 [2019年3月1日] （繁体中文）. ^ Jason Pan. Reliance on China makes Taiwan vulnerable: Clinton. 《台北時報》. 2014年6月25日 [2019年3月1日] （英语）. ^ Scarlett Chai和S.C. Chang. Economic, political independence not lost: MAC. 中央通訊社. 2014年6月24日 [2019年3月1日] （英语）. ^ Did The Sunflower Movement Have A Flexible View Of The Law?. Daybreak Project. 2017年7月25日 [2019年3月1日] （英语）. ^ Why Was Violence Never On The Table During The Sunflower Movement?. Daybreak Project. 2017年7月24日 [2019年3月1日] （英语）. ^ 劉定綱 2014年， 第19頁; 黃恐龍 2014年， 第181頁至第182頁; 港千尋 2015年， 第39頁至第40頁、第88頁至第89頁; 吳叡人等 2016年， 第302頁至第323. ^ 朱炼. 反服贸活动中遭硬闯破坏 台“行政院”拟求偿300万. 中國台灣網. 2014年4月9日 [2019年3月1日] （简体中文）. ^ 468.0 468.1 468.2 Liu Shi-yi和Christie Chen. Key figures in student protests questioned by prosecutors. 中央通訊社. 2015年4月21日 [2019年3月1日] （英语）. ^ 469.0 469.1 469.2 Rich Chang. Prosecutors question protest leaders. 《台北時報》. 2014年4月22日 [2019年3月1日] （英语）. ^ 470.0 470.1 吳叡人等 2016年， 第365頁至第366頁. ^ Alison Hsiao. Legal authorities are ‘abusing powers’. 《台北時報》. 2014年6月6日 [2019年3月1日] （英语）. ^ 晏山農等 2015年， 第331頁至第333頁; 港千尋 2015年， 第19頁; 吳叡人等 2016年， 第365頁至第366頁. ^ Peggy Tsai和Scully Hsiao. Another 39 Sunflower Movement protesters indicted. 中央通訊社. 2015年5月5日 [2019年3月1日] （英语）. ^ 474.0 474.1 Tai Ya-chen和Elizabeth Hsu. Government changes course on Sunflower Movement protesters. 中央通訊社. 2016年5月23日 [2019年3月1日] （英语）. ^ 475.0 475.1 Stacy Hsu和Abraham Gerber. Cabinet drops charges against students. 《台北時報》. 2016年5月24日 [2019年3月1日] （英语）. ^ Jason Pan. Sunflower leaders to face justice system ‘head-on’. 《台北時報》. 2016年6月15日 [2019年3月1日] （英语）. ^ 477.0 477.1 Elaine Hou、Wang Yang-yu和Liu Shih-yi. Sunflower movement leaders acquitted over legislature occupation. 中央通訊社. 2017年3月31日 [2019年3月1日] （英语）. ^ 478.0 478.1 478.2 夏丽娟. 台"太阳花学运"黄国昌等22被告再次被判无罪. 海外網. 2018年3月13日 [2019年3月1日] （简体中文）. ^ Hsiao Po-wen、Wang Yang-yu和Frances Huang. High court upholds acquittal of Sunflower Movement leaders. 中央通訊社. 2018年3月13日 [2019年3月1日] （英语）. ^ Jason Pan. High Court acquits protesters against China trade pact. 《台北時報》. 2018年3月14日 [2019年3月1日] （英语）. ^ Discourse About Police Within The Sunflower Movement. Daybreak Project. 2017年7月25日 [2019年3月1日] （英语）. ^ 483.0 483.1 寇謐將. Riot Police Crack Down on Taiwanese Protesters. 《外交家雜誌》. 2014年3月24日 [2019年3月1日] （英语）. ^ Police Violence In The Sunflower Movement. Daybreak Project. 2017年7月24日 [2019年3月1日] （英语）. ^ Por Lu Chen. Crece la tensión en Taiwán después de una violenta dispersión. 《大紀元時報》. 2014年3月25日 [2019年3月1日] （西班牙语）. ^ 晏山農等 2015年， 第59頁至第62頁、第64頁至第65頁; 吳叡人等 2016年， 第192頁. ^ 康仁俊. 鎮暴警強驅學生 台聯：台灣版的六四天安門！. 雅虎新聞（英语：Yahoo! News）. 2014年3月24日 [2019年3月1日] （繁体中文）. ^ 晏山農等 2015年， 第61頁至第62頁、第65頁; 吳叡人等 2016年， 第192頁、第194頁、第202頁、第326頁至第330頁、第338頁至第344頁、第360頁至第365頁. ^ 489.0 489.1 Loa Iok-sin. TRADE PACT SIEGE: Journalists accuse police of attacking them. 《台北時報》. 2014年3月25日 [2019年3月1日] （英语）. ^ Chang Wen-chuan和Jason Pan. Premier to face court over evictions. 《台北時報》. 2014年7月30日 [2019年3月1日] （英语）. ^ Loa Iok-sin. Premier in court over violent evictions. 《台北時報》. 2014年7月31日 [2019年3月1日] （英语）. ^ Liao Ren-kai和Elizabeth Hsu. Policeman sentenced to 3 months in jail for cursing activists. 中央通訊社. 2014年8月27日 [2019年3月1日] （英语）. ^ Jason Pan. Teacher awarded compensation for Sunflower beating. 《台北時報》. 2015年8月9日 [2019年3月1日] （英语）. ^ Hsiao Ting-fang. Lawyers seek state violence payments. 《台北時報》. 2015年9月16日 [2019年3月1日] （英语）. ^ 林望. 中国政府、台湾立法院占拠の学生ら批判. 《朝日新聞》. 2014年4月16日 [2019年2月14日] （日语）. ^ 鄭崇生. 習近平：遏制台獨分裂不會動搖. 中央通訊社. 2014年5月7日 [2019年3月1日] （繁体中文）. ^ 陈键兴. 习近平：两岸一家亲 没有什么心结不能化解. 新華網. 2014年5月7日 [2019年3月1日] （简体中文）. ^ 498.0 498.1 Ben Blanchard. China's Xi stresses benefits of ties after Taiwan protests. 路透社. 2014年5月7日 [2019年3月1日] （英语）. ^ Lawrence Chung. We're listening, Xi Jinping says to Taiwan. 《南華早報》. 2014年5月8日 [2019年3月1日] （英语）. ^ 500.0 500.1 500.2 Loa Iok-sin. MAC hiding unfavorable data: DPP. 《台北時報》. 2014年5月22日 [2019年3月1日] （英语）. ^ Huang Chiao-wen和Y.F. Low. Trade-in-goods pact with China unlikely this year: official. 中央通訊社. 2014年6月9日 [2019年3月1日] （英语）. ^ 502.0 502.1 502.2 Lawrence Chung. Beijing ‘freezes’ cooperation talks with Taiwan over stalled trade pact. 《南華早報》. 2014年6月10日 [2019年3月1日] （英语）. ^ Kelven Huang、Huang Chiao-wen和Y.F. Low. Talks with China suspended on stalled services pact. 中央通訊社. 2014年6月9日 [2019年3月1日] （英语）. ^ Helen Ku. Economics ministry urges action on cross-strait trade. 《台北時報》. 2014年6月10日 [2019年3月1日] （英语）. ^ Attempts By The KMT And China To Intervene After The Movement?. Daybreak Project. 2017年7月25日 [2019年3月1日] （英语）. ^ 台湾戦略、仕切り直し＝立法院占拠受け－中国. 時事通信社. 2014年4月16日 [2019年2月14日] （日语）. ^ 美聯社. China’s First Minister-Level Official Visits Taiwan. 《時代雜誌》. 2014年6月25日 [2019年3月1日] （英语）. ^ 509.0 509.1 港千尋 2015年， 第248頁. ^ 寇謐將. Was Taiwan’s Sunflower Movement Successful?. 《外交家雜誌》. 2014年7月1日 [2019年3月1日] （英语）. ^ The Appendectomy Project. Daybreak Project. 2017年7月25日 [2019年3月1日] （英语）. ^ 514.0 514.1 Wen Kuei-hsiang和Jeffrey Wu. Student protesters form new group to tackle referendum rules. 中央通訊社. 2014年5月18日 [2019年3月1日] （英语）. ^ Lii Wen. Referendum Act reform petition to enter phase II. 《台北時報》. 2015年3月11日 [2019年3月1日] （英语）. ^ 晏山農等 2015年， 第410頁; 港千尋 2015年， 第248頁. ^ Other Afterlives Of The Movement?. Daybreak Project. 2017年6月22日 [2019年3月1日] （英语）. ^ 黃恐龍 2014年， 第289頁至第319頁; 港千尋 2015年， 第246頁至第249頁. ^ Indie DaDee. Daybreak Project. 2017年7月24日 [2019年3月1日] （英语）. ^ 公民聲音團隊 2014年， 第16頁; 黃恐龍 2014年， 第112頁至第113頁、第290頁至第295頁; 晏山農等 2015年， 第129頁至第131頁、第185頁至第186頁、第290頁至第300頁、第411頁; 港千尋 2015年， 第245頁. ^ 黃恐龍 2014年， 第307頁至第310頁; 港千尋 2015年， 第40頁、第246頁至第247頁; 吳叡人等 2016年， 第41頁至第42頁. ^ 黃恐龍 2014年， 第310頁至第313頁; 港千尋 2015年， 第247頁. ^ 黃恐龍 2014年， 第314頁至第319頁; 港千尋 2015年， 第247頁. ^ 525.0 525.1 525.2 William Lowther. Sunflower leaders urge US to drop ‘one China’ policy. 《台北時報》. 2014年8月23日 [2019年3月1日] （英语）. ^ Attempts To Occupy The Legislative Yuan Following The Sunflower Movement?. Daybreak Project. 2017年7月25日 [2019年3月1日] （英语）. ^ What Led Activists To Enter Electoral Politics After The Sunflower Movement?. Daybreak Project. 2017年7月24日 [2019年3月1日] （英语）. ^ Politicians Attempting To Capture The Youth Vote After The Sunflower Movement. Daybreak Project. 2017年7月26日 [2019年3月1日] （英语）. ^ Ben Blanchard. China's Xi calls for 'equal' political talks with Taiwan. 路透社. 2015年5月4日 [2019年3月1日] （英语）. ^ 534.0 534.1 534.2 楊虔豪. ｢中国への嫌悪感｣が台湾民進党圧勝の背景. 東洋經濟新報社. 2014年12月4日 [2019年2月14日] （日语）. ^ Cindy Sui. What unprecedented protest means for Taiwan. 英國廣播公司新聞網. 2014年3月26日 [2019年3月1日] （英语）. ^ 蔣金和林揚軼. 太陽花政黨：2014闖進立法院，2016選進去. 端傳媒. 2016年1月17日 [2019年3月1日] （繁体中文）. ^ Chen Wei-han. New Power Party announces leadership structure. 《台北時報》. 2015年9月14日 [2019年3月1日] （英语）. ^ 政策/政見. 時代力量. [2019年3月1日] （繁体中文）. ^ Josh Horwitz. Taiwan’s newest politicians include a rock star and an aboriginal activist. Quartz. 2016年1月18日 [2019年3月1日] （英语）. ^ 田中靖人. 補選出馬表明の学生運動指導者に痴漢の過去　台湾で波紋広がる. 《產經新聞》. 2015年2月25日 [2019年2月14日] （日语）. ^ 543.0 543.1 田中靖人. 「痴漢」告白の台湾学生指導者、出馬取りやめ. 《產經新聞》. 2015年2月25日 [2019年2月14日] （日语）. ^ 2016 Electoral Successes A Result Of The Sunflower Movement?. Daybreak Project. 2017年7月26日 [2019年3月1日] （英语）. ^ 鈴木玲子. 台湾・立法院選「時代力量」に勢い…与党地盤で善戦. 《每日新聞》. 2016年1月16日 [2019年2月14日] （日语）. ^ Alison Hsiao. ELECTIONS: DPP secures absolute majority in Legislative Yuan. 《台北時報》. 2016年1月17日 [2019年3月1日] （英语）. ^ Linda van der Horst. Taiwan's 'Third Force' Makes Its Presence Known in Legislature. 《外交家雜誌》. 2014年3月20日 [2019年3月1日] （英语）. ^ Barbara Celis. La 'hacker' superdotada y transgénero que ha revolucionado el gobierno taiwanés. 《機密報（英语：El Confidencial）》. 2016年9月3日 [2019年3月1日] （西班牙语）. ^ Activist Subculture. Daybreak Project. 2017年8月10日 [2019年3月1日] （英语）. ^ Activist Merchandise. Daybreak Project. 2017年7月20日 [2019年3月1日] （英语）. ^ Books And Film Popular Among Activists. Daybreak Project. 2017年7月20日 [2019年3月1日] （英语）. ^ Activist Coffee Shops, Live Houses, and Bookstores. Daybreak Project. 2017年7月20日 [2019年3月1日] （英语）. ^ Frequent Protest Spaces In Taipei. Daybreak Project. 2017年7月25日 [2019年3月1日] （英语）. ^ What Was The “Black Box” And Why Were Occupiers Opposed To It?. Daybreak Project. 2017年7月20日 [2019年3月1日] （英语）. ^ 黃恐龍 2014年， 第34頁; 港千尋 2015年， 第95頁至第98頁、第106頁至第115頁. ^ 胡治言. 太陽餅過時囉！　現在買伏冒送政院正夯. 《蘋果日報》. 2014年3月25日 [2019年3月1日] （繁体中文）. ^ 公民聲音團隊 2014年， 第9頁; 黃恐龍 2014年， 第190頁至第193頁; 港千尋 2015年， 第240頁、第242頁至第243頁. ^ Activist Artists and Bands. Daybreak Project. 2017年7月20日 [2019年3月1日] （英语）. ^ Chen Chih-chung和Elaine Hou. Festive rally closes Legislature occupation as protesters head home. 中央通訊社. 2014年4月10日 [2019年3月1日] （英语）. ^ 寇謐將. Sunflowers End Occupation of Taiwan’s Legislature. 《外交家雜誌》. 2014年4月11日 [2019年3月1日] （英语）. ^ 公民聲音團隊 2014年， 第10頁; 港千尋 2015年， 第243頁至第244頁; 黃恐龍 2014年， 第195頁至第198頁; 晏山農等 2015年， 第81頁至第82頁; 港千尋 2015年， 第83頁至第85頁、第87頁、第192頁至第193頁. ^ 公民聲音團隊 2014年， 第10頁晏山農等; 2015年 港千尋， 第81頁至第82頁; 2015年， 第83頁、第243頁至第244頁. ^ 公民聲音團隊 2014年， 第11頁; 黃恐龍 2014年， 第195頁至第196頁; 晏山農等 2015年， 第91頁. ^ 公民聲音團隊 2014年， 第7頁; 晏山農等 2015年， 第44頁. ^ Art and the Sunflower Movement. Daybreak Project. 2017年7月24日 [2019年3月1日] （英语）. ^ 黃恐龍 2014年， 第18頁至第22頁、第114頁至第176頁、第228頁至第232頁; 晏山農等 2015年， 第183頁至第184頁; 港千尋 2015年， 第13頁、第15頁、第92頁至第94頁、第208頁至第219頁; 吳叡人等 2016年， 第138頁至第139頁. ^ 晏山農等 2015年， 第290頁至第291頁; 吳叡人等 2016年， 第373頁至第383頁. ^ 晏山農等 2015年， 第320頁至第324頁; 吳叡人等 2016年， 第126頁至第127頁. ^ What Was The Significance Of The Sunflower Movement?. Daybreak Project. 2017年7月15日 [2019年3月1日] （英语）. ^ 陳沂庭. 群眾占領議場 國會史上首次. 中央廣播電臺. 2014年3月19日 [2019年3月1日] （繁体中文）. ^ 法新社. One year on: impact of ‘sunflower’ movement protests in Taiwan continues to blossom. 《南華早報》. 2015年3月1日 [2019年3月1日] （英语）. ^ 劉定綱 2014年， 第16頁; 黃恐龍 2014年， 第5頁; 晏山農等 2015年， 第324頁至第330頁. ^ What Changed About The Social Atmosphere In Taiwan After The Sunflower Movement?. Daybreak Project. 2017年11月13日 [2019年3月1日] （英语）. ^ Why Did The Sunflower Movement Rupture The Everyday For Many Participants?. Daybreak Project. 2017年7月24日 [2019年3月1日] （英语）. ^ Generational Conflict And The Sunflower Movement. Daybreak Project. 2017年6月10日 [2019年3月1日] （英语）. ^ The Left Political Vision Of The Sunflower Movement?. Daybreak Project. 2017年7月26日 [2019年3月1日] （英语）. ^ 中央通訊社. Tang Prize’s Yu praises Sunflower protests. 《台北時報》. 2014年9月21日 [2019年3月1日] （英语）. ^ 晏山農等 2015年， 第97頁至第98頁、第102頁; 吳叡人等 2016年， 第19頁、第25頁至第50頁. ^ The Endgame Of The Movement. Daybreak Project. 2017年11月13日 [2019年3月1日] （英语）. ^ 劉子維. 台灣學運領袖陳為廷談「佔中」一週年：「香港太難了」. 英國廣播公司新聞網. 2015年10月1日 [2019年3月1日] （英语）. ^ 公民聲音團隊 2014年， 第16頁; 晏山農等 2015年， 第193頁至第194頁、第324頁至第326頁; 吳叡人等 2016年， 第156頁、第264頁至第265頁. ^ John Scot Feng. Activist profiles: the leaders of the Sunflower Student Movement. 中央通訊社. 2014年3月31日 [2019年3月1日] （英语）. ^ Jenny W. Hsu. Young Protesters Shaking Up Taiwan's China Policy. 《華爾街日報》. 2014年4月1日 [2019年3月1日] （英语）. ^ Personalism and Leadership in the Sunflower Movement. Daybreak Project. 2017年7月24日 [2019年3月1日] （英语）. ^ 黃恐龍 2014年， 第237頁至第245頁; 晏山農等 2015年， 第105頁、第325頁. ^ Criticisms Of The Central Leadership In The Legislative Yuan. Daybreak Project. 2017年11月14日 [2019年3月1日] （英语）. ^ Maintaining The Legitimacy Of The Movement. Daybreak Project. 2017年7月24日 [2019年3月1日] （英语）. ^ Internal Dissent Within The Movement. Daybreak Project. 2017年6月10日 [2019年3月1日] （英语）. （繁体中文） 劉定綱. 《318佔領立法院：看見希望世代》. 臺灣臺北: 奇異果文創事業. 2014年4月18日. ISBN 978-9869022743. （繁体中文） 公民聲音團隊. 《那時 我在：公民聲音318-410》. 臺灣新北: 無限出版. 2014年8月27日. ISBN 978-9869014793. （繁体中文） 黃恐龍. 《野生的太陽花》. 臺灣臺北: 玉山社. 2014年9月15日. ISBN 978-9862940921. （繁体中文） 晏山農、羅慧雯、梁秋虹和江昺崙. 《這不是太陽花學運：318運動全記錄》. 臺灣臺北: 允晨文化. 2015年3月1日. ISBN 978-9865794347. （繁体中文） 港千尋. 《革命的做法：從318太陽花看公民運動的創造性》. 臺灣臺北: 心靈工坊. 2015年3月16日. ISBN 978-9863570257. （繁体中文） 吳叡人、林秀幸和蔡宏政. 《照破：太陽花運動的振幅、縱深與視域》. 臺灣新北: 左岸文化. 2016年3月23日. ISBN 978-9865727345.